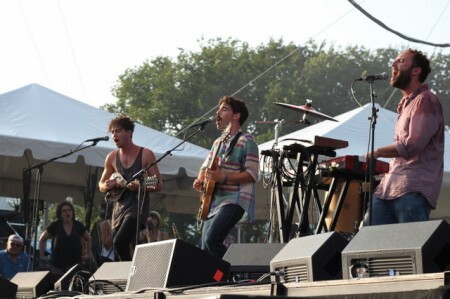 I couldn’t go to Lollapalooza this year, despite my preview post they featured. Not only was I ill-equipped to fund another music trip this summer, but I am frankly not sure of my fortitude to handle Chicago in August, despite the great lineup. So in this case, I call in my minions, and this minion this year was the marvelous Adam Sharp who writes the Songs For The Day blog (a daily must-read). His musical tastes and mine almost perfectly align, and there are few things more thrilling than meeting your identical music twin. Let’s see what Adam loved. 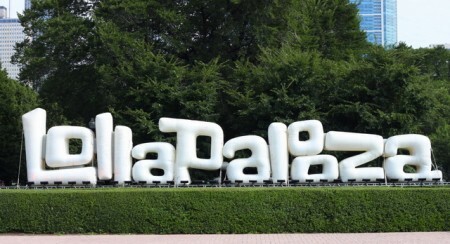 There are things you simply cannot prepare for, and I now know that Lollapalooza is one such thing. No amount of hydrating, planning who you are going to see or anything else can prepare you for the mammoth beast that is 115 acres of music filled with 90,000 sweaty people each day checking out bands playing 8 different stages. Prepared or not, I went to Lollapalooza to have an amazing time, and that’s pretty much exactly what I had as the skyscrapers and Lake Michigan provided the perfect backdrop for the great music being played. It was a hell of an experience, filled with some incredible moments that I’m pretty sure I’ll never forget. Now that I have fully replenished all the missing water and nutrients in my body let’s talk about what happened in Chicago. Wye Oak was the first band I saw at the festival, and I found their set to be a great way to kick off the entire weekend. Watching Wye Oak it struck me how much your appreciation grows for their music when you see them live. Jenn Wasner is as skilled as they come with the guitar, and Andy Stack is incredibly impressive as he drums with one hand and uses his left on a myriad of synths and other machines. Despite coming out and having some audio trouble (first a broken amp, then a broken guitar pedal), the rather large early crowd was totally behind them and they managed to rip through their set in most impressive fashion. I remember when Heather wrote about the ridiculously large crowd for Foster the People at Sasquatch, and I was pretty interested to see if that would happen again at Lollapalooza. Um, yeah. That HAPPENED. About a half hour before the set started there had to have been 10-15,000 people waiting, and by the time they started that number grew to the point of being outrageous. They delivered a really enjoyable, incredibly sweaty show in the mid-afternoon heat to a completely adoring crowd, noting in the middle of their set that this was easily the largest crowd they had ever played to. It’s always nice when you can tell a band can’t believe what’s happening, and you most assuredly got that feeling from Foster the People. I’ve really enjoyed Cults’ debut LP released earlier this summer, but given the secrecy behind the band, I wasn’t totally sure what to expect. Cults came out and delivered an extremely entertaining set of their dark, doo-woppy tinged pop music, with lead singer Madeline Follin proving herself to be plenty charismatic. The crowd was into it, dancing and crowding together trying to get closer. The set was a really great way to cool down in the middle of the day. In a word, Mountain Goats were unbelievable. Heather had been (loudly) telling me of their greatness in the lead up to Lollapalooza and they certainly proved that she wasn’t lying. 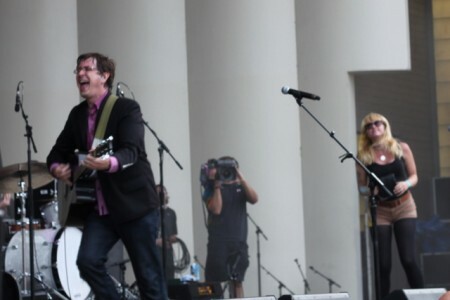 I think the most striking thing about the set was the amount of fun everyone seemed to be having (including the band) as lead singer John Darnielle wove exceptionally personal and dark stories. The crowd and the band (including Darnielle) had smiles on their faces throughout, and you could tell that this intense music was resonating in a cathartic way for so many in the crowd. The set ended on a high, with Jenn Wasner of Wye Oak (Darnielle introduced her as a member of the band who has put out the best record of the year so far) coming out to help lead through an incredible rendition of ‘This Year.’ The crowd ate up every minute of it, shouting along every word feverishly and giving an applause that was a borderline roar at the end. It was the single best moment of Friday for me. 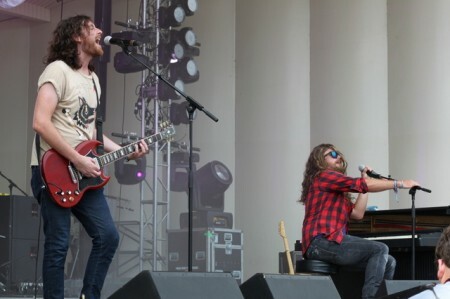 J Roddy Walston & The Business are a group of bad, bad men, and they were playing Lollapalooza to make sure everyone was well aware of that fact. I hadn’t gotten terribly familiar with the music beforehand, but it didn’t matter: there was no way to not feel the energy of the crowd grow as the band rollicked through their set of dirty, southern-tinged rock and roll. It was a superb way to start the day, and judging by the constantly expanding crowd during the 45 minutes they played, lots of other people found that to be true as well. You know when you want a band to be awesome live and then they are? That’s pretty much exactly how Typhoon’s set went, with them absolutely rocking a large, loving crowd while barely fitting on the tiny stage they were afforded. From first note to last, it was pretty evident that Typhoon deserved a much larger stage (they had 13 members after all), with the crowd clapping along at all the right points (and batting around a ton of beach balls for good measure). It was really great to see that the word had gotten around about how special the band is. By the end of the set you could hear people talking about how great the performance was. I had heard from a number of people that I needed to make it a priority to get to Fitz and the Tantrums, that I would have an immense amount of fun and it would be totally worth it to fight through the huge crowd. That was a huge understatement, as the band had the crowd dancing around from the get-go, with seemingly everyone in the crowd having a huge smile on their face. The ending to their set was perfect, with lead singer Michael Fitzpatrick stopping their hit, ‘Moneygrabber,’ right before the last chorus and forcing everyone (and seriously…10,000+ people did it) to squat down and then jump up and go insane as they played the last chorus. It was one of those moments I wasn’t expecting and it was certainly one of the most memorable moments of the entire festival for me. 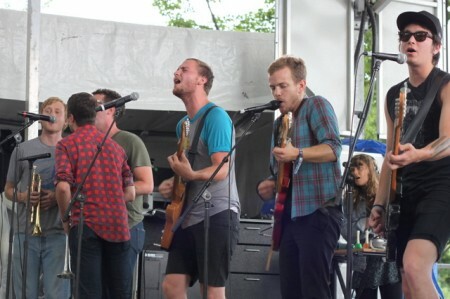 This was the best performance of the festival in my eyes, as pretty much everything about it was perfect. I managed to squeeze all the way up to the front right of the stage, ending up with a great view of the band and the insanely large, eager crowd as the golden hour set in on Chicago. While the entire set was spot-on, there are two moments that stuck out for me. The first was when vocalist/guitarist/percussionist/keyboardist Kelcey Ayer dedicated ‘Airplanes’ to his mom, who I think was the woman who immediately leapt to her feet and yelled along all the words while dancing. It was a pretty special moment. The second moment, my favorite moment of the entire festival, was during set closer ‘Sun Hands.’ As the sun was coming out from behind the clouds and the band got to the line ‘I want to lift my hands towards the sun,’ the entire crowd that I could see spontaneously lifted their hands up towards the setting sun, as the downtown skyscrapers provided a beautiful backdrop to the sea of hands. It was just one of those really perfect, incredible moments where music and life come together to produce something you won’t forget. It was magnificent in every way imaginable. I decided to take in the set from Beirut at a side stage instead of joining the crowds for the headliners, which turned out to be a rewarding choice. 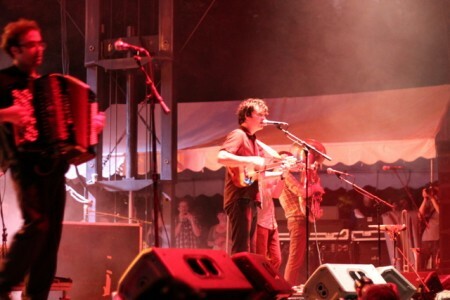 A large, enthusiastic group gathered as Beirut’s baroque stylings and Zach Condon’s rich voice filled the nighttime air with skyscrapers illuminated the backdrop. Beirut sounded wonderful, providing a relaxing, gorgeous ending to one of better days I can remember. 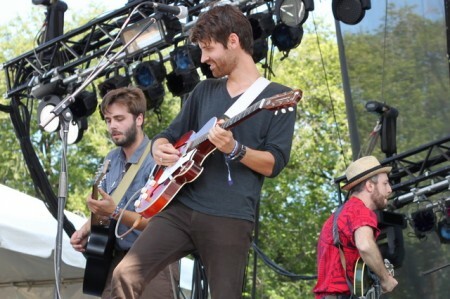 It’s a testament to Lord Huron’s growing success that they were able to draw a rather large crowd as the first band playing on Sunday morning. They delivered a great set, adding new depth to their songs and providing a terrific way to ease into a third day of heat and music. I had the added bonus of standing next to the bassist’s family, who were extremely nice and very proud, dancing, constantly exchanging smiles with him and letting those around us know they were his parents/sister. It was a neat, personal moment to witness. I spent a good deal of Sunday wandering around the grounds, trying to find something to catch my attention after Lord Huron, and coming up empty until Dale Earnhardt Jr. Jr. took the stage. I have enjoyed their new album all summer long, having seen them in a dive bar a few months ago and hoping their show would translate to a much larger venue. Judging by all the dancing, singing along and cheering it appears they did a great job of introducing themselves to an audience that was pretty large despite the main stage acts starting to get to the headliners. They are a boatload of fun, crowd size be damned. …. when on the horizon what looked like a full-on deathstorm started to show its face. I knew things were about to get serious when they started to take down the banners from the sides of the stages, and knew I needed to run like hell for cover. I called my sister (who lives on the north side of the city) and asked her about the weather, to which she replied ‘You mean it’s not pouring there yet?’ So, I trudged as fast as possible across the massive field, making it up the stairs to the main concourse area just as the first raindrops turned quickly into a torrential monsoon. I ended up ducking into a tent manned by a really kind volunteer lady and filled with an odd bunch of people who I was pretty sure had fake British accents. It wasn’t exactly how I envisioned my Lollapalooza adventure ending, but in retrospect it was kinda fun and memorable. 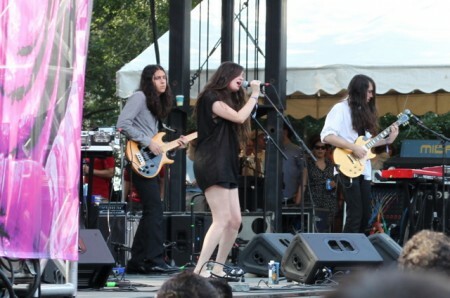 - I was introduced to the service provided by LotuSIGN during J Roddy Walston and the Business’ set for the first time. They are an incredible group of interpreters that sign select sets during the festival for the deaf, but they do far more than just sign. Each song turns into a sort of performance art to go along with the lyrics, with the interpreter playing air drums or air guitar at all the right moments. It was something I hadn’t considered, and even though I am not deaf I found it entirely enjoyable and fantastic to watch. - I used to think people recording shows on their cell phone were annoying, but during the festival I found something far worse: at multiple sets I saw people holding up their iPads (or other tablets) to record. That’s not okay, kids. - Passing through the area before Noah and the Whale took the stage, I notice they were pumping what sounded like a rock orchestra version of ‘Bohemian Rhapsody’ over the speakers. The entire crowd sang it, clapping along and cheering as though Queen was up there performing it. It was like a festival version of Wayne’s World. - One of the really awesome things about the festival was that they had tremendous food choices. I always try to avoid buying food and such at these types of events, but when a vendor board shows me that I can make a meal out of a Lobster Corndog and Parmesan Truffle Popcorn, well, I start reaching for the money. It was as delicious as it sounds. Actually, more. Way more. 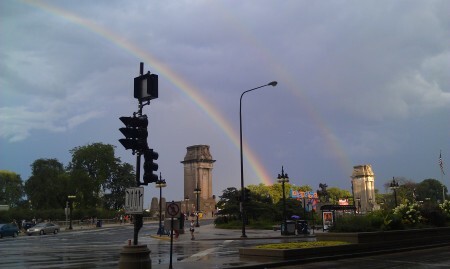 - I’m thinking that the double rainbow (and throngs of people yelling ‘DOUBLE RAINBOW! OH MY GOD!) that showed up after the storm was Mother Nature trying to redeem herself a bit for the chaos she caused. While it didn’t fully makeup for how bummed I was about missing out on Explosions in the Sky, it was a pretty cool moment to end a weekend that was perfect as it was. 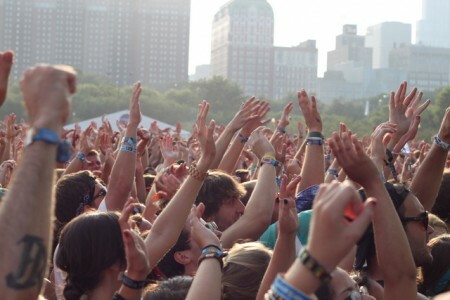 Tagged with guest post, lollapalooza.